Wates has completed a social housing refurbishment programme, with Wates Living Space handing over the revamped homes four weeks ahead of schedule. Wates has completed a major social housing refurbishment programme that has given a new lease of life to the Ben Street neighbourhood in Clayton, with Wates Living Space handing over the revamped homes four weeks ahead of schedule. 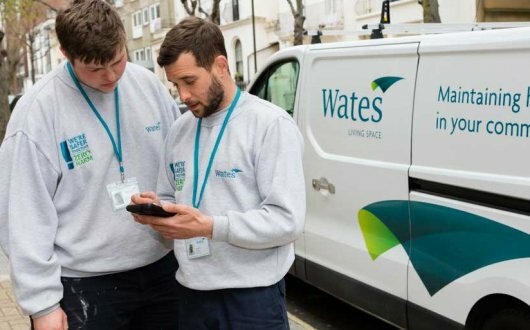 Completion of the project comes almost 12 months after Wates Living Space began work to fully refurbish 62 previously vacant properties as well as delivering facelift works to a further 151 properties. Delivered on behalf of Manchester City Council, the work has seen Wates Living Space bring the 62 derelict homes up to the decent homes standard. Work included re-roofing, energy efficiency upgrades, fully-fitted kitchens and bathrooms, flooring and carpeting as well as the installation of new heating systems. The facade works to the 151 properties included replacing all existing windows and doors with modern UPVC, improving guttering and cleaning brickwork plus the refurbishment of communal alley space and external walling. As part of its work on behalf of Manchester City Council to rebuild the Ben Street community, Wates Living Space delivered a host of initiatives to positively benefit local people. Throughout the work, Wates provided project-based training for 37 local people through its Building Futures programme, a training course designed to give jobseekers a route into a career in the industry. Fulfilling a commitment to appointing local supply chain partners, Wates Living Space also spent £100k with local social enterprises, including Clean Start, Commercial Foundation, Boulevard Deli and Good Mood Food. The team engaged in a number of local charity initiatives through the project’s nominated charity champion. Throughout the contract, this saw the Wates Living Space team donate over 600 hours and £34k to local good causes. Wates also supported grant initiatives through the Wates Family Enterprise Trust’s Wates Giving initiative, which saw £22k donated to The Aquarius Centre and £4k to Growing in the City. “The work delivered by the Wates Living Space team at Ben Street is truly transformative. To take homes that have laid empty for 20 years and bring them up to this standard of quality is a task of great care and expertise and it is truly heartening to see the difference that this has made to residents. Cllr Suzanne Richards, Manchester City Council’s executive member for housing and regeneration, said: “First and foremost, I would like to welcome the new east Manchester tenants in to their new homes. These are some of the luckiest residents in the city as the first to access the refurbished housing at the Ben Street regeneration area. Wates has done a remarkable job turning these properties into high-quality family homes.